Fwd: ABJ Extra-November 4, 2015 – We are Thankful for You, Honey! November officially kicks off the holiday season, the time of year when families are getting together to enjoy each other’s company, catch up and share stories, or even play a backyard football game. And what brings people together like a good meal? We’re not sure about you, but there is just something about being home for the holidays that makes everything a little bit better, until it comes to the menu planning, that is. 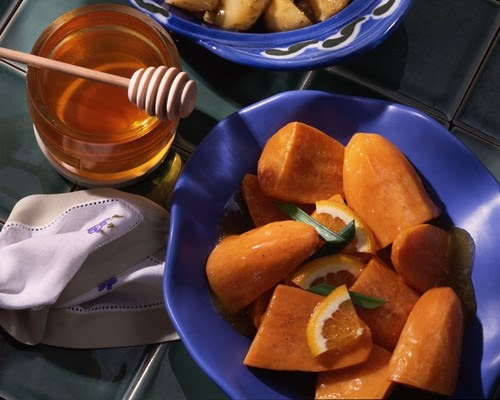 But fear not, we are here to make your Thanksgiving a little easier with these five delicious, honey-inspired recipes that are sure to be a hit with all the relatives and friends who are gathered around the family table! Wash and pierce potatoes or yams. Place on a piece of heavy-duty foil and bake at 375°F for 40 to 50 minutes until just tender. Cool, peel and cut into 1-1/2 inch pieces. Spray 8×8-inch baking dish with nonstick cooking spray. Place cooked potatoes or yams in dish; set aside. In small pan, combine orange juice, honey, cornstarch, ginger, nutmeg and salt. Stir until smooth. Cook over medium-high heat stirring until thick and mixture begins to boil. Stir and cook for one minute. Remove from heat and stir in butter. Pour over potatoes or yams stirring to coat. 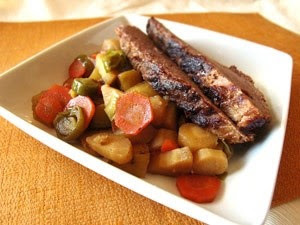 Bake at 350°F for 25 to 30 minutes until hot and potatoes are tender. In large bowl, place crumbled cornbread. Remove sausage from casing. In medium skillet, crumble and sauté sausage until brown. Using slotted spoon, remove sausage from skillet and add to cornbread. Drain all but 1 Tablespoon of fat. Return skillet to medium-high heat; stir in bell pepper, onion and celery. Sauté until vegetables are soft, about 5 minutes. Stir in parsley, thyme, salt and pepper. Cool slightly, then add to cornbread. In small bowl, combine broth and honey. Pour over stuffing. Place stuffing in a greased 9×9-inch baking dish. Cover dish with foil and bake at 350°F for 20 minutes. Remove foil and bake another 10 minutes until stuffing is lightly browned. 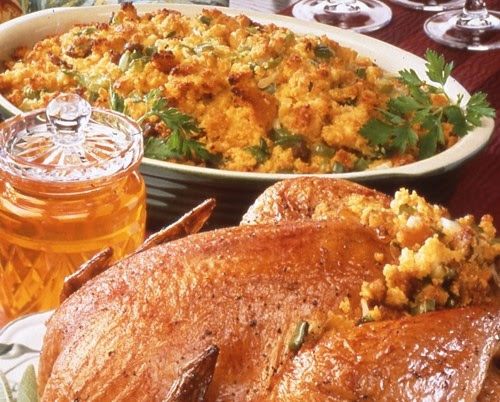 As an alternative, pack you may pack stuffing into poultry cavity before roasting. Click here to see a digital sample of the American Bee Journal. choose digital or the printed version. Click here to request your 2015 printed catalog!!! 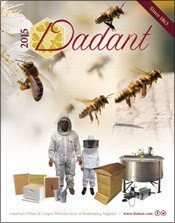 Check out Dadant & Sons, Inc. Website. Click here. Unsubscribe dmg623@hotmail.com from this list. Copyright (C) 2015 American Bee Journal All rights reserved. 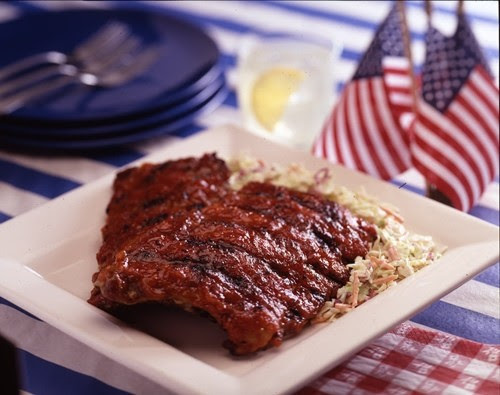 There are so many great things about the month of July; it’s designated Grilling Month, National Baked Beans Month, National Ice Cream Month, and let’s not forget about Independence Day! There will be backyard cookouts, neighborhood block parties, fireworks, and we will gather with family and friends to celebrate the adoption of the Declaration of Independence on July 4, 1776. We will toast our loved ones who have fought and sacrificed for our freedom and independence. In this month’s edition of Honey Feast, we’ve selected recipes that make Old Glory proud. Like they say, it’s as American as Apple Pie! In a blender, combine orange juice, honey, lemon and lime juices until honey is dissolved. Add blueberries and ice. Puree. Serve in beverage glasses garnished with a lemon or lime wheel. Sauté bacon and onion until onion is tender; combine with remaining ingredients in shallow 2-quart oven-safe baking dish. Cover with lid or aluminum foil and bake at 350°F 30 minutes. Uncover and bake 45 minutes longer. *Three 15 oz. 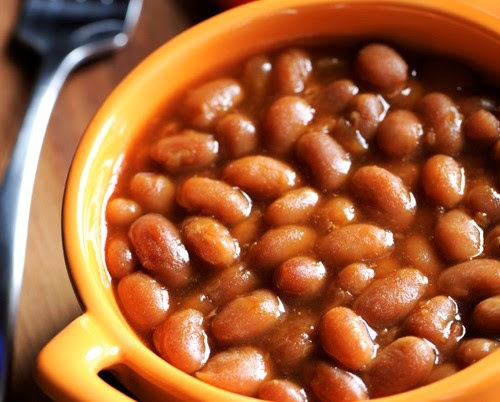 cans cooked navy beans can be substituted. In saucepan, heat oil and onions over medium heat; cook until golden brown, about 10 minutes. Stir in garlic; cook until just fragrant. Stir in remaining ingredients except pork. Cover and simmer over very low heat for 5 minutes. Remove from heat. Place ribs in foil-lined baking pan. Spread evenly with 1 cup sauce. Set remaining sauce aside. Cover baking pan with foil and bake at 350°F for 1 hour until ribs are tender and cooked through. Meanwhile, prepare grill with medium-high heat. Transfer cooked ribs to grill; cook, turning frequently until ribs are well browned. Transfer to cutting board. Brush with remaining 1/2 cup sauce; cut and serve. Makes 4 servings. Place the milk, cream, and egg yolks in a heavy saucepan. Slowly whisk to combine. Cook over low heat, stirring gently, for about 5 minutes, or until the milk is hot and the mixture begins to coat a spoon. If you don’t have a heavy saucepan, use a double boiler so the egg yolks do not curdle. Remove from the heat. Add the honey, almond butter, and almond extract and stir until thoroughly blended. Refrigerate, uncovered, until chilled. Following the manufacturer’s directions, process the custard in an ice-cream maker. 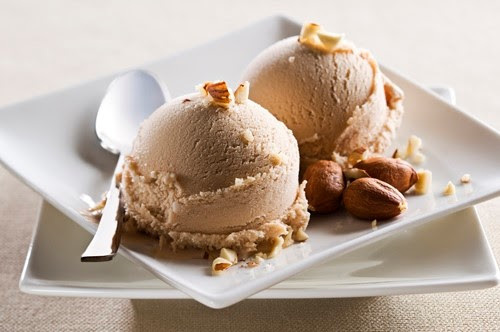 Scoop the ice cream into a freezer container and freeze until ready to serve. It will keep for at least 2 weeks. Combine ingredients in blender. 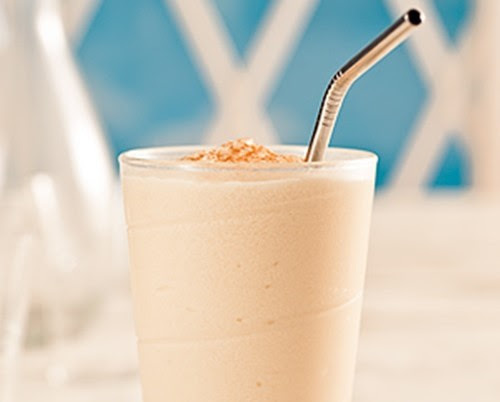 Blend until smooth and garnish with a light cinnamon sprinkle. There’s something special to us about using fresh fruit in our cooking; we’re not sure if it’s the fact that it makes us feel healthier or just that we’re taking advantage of nature’s offerings, but we love to incorporate berries into our diets and this dessert satisfies both our love for fruits and our sweet tooth! 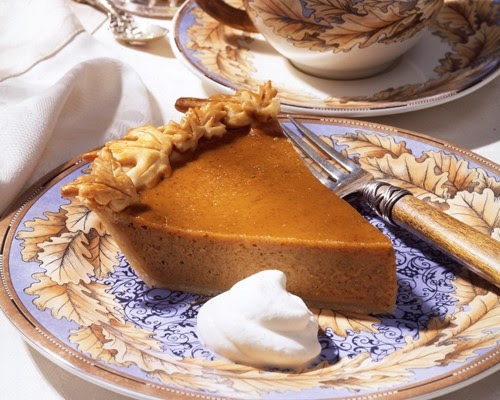 The great thing about this treat is that once you make the crust (which is totally worth it, but you can always simplify things by using a store-bought crust! ), the rest is a breeze! Instead of dealing with slightly more complex cream filling, we turned to ricotta and mascarpone to give us a deliciously light, not-too-sweet filling that perfectly complements the berries. Add to that a little lemon zest for zing and you’ve got a wonderful springtime dish that will add to any meal! Try it out and enjoy—you won’t be disappointed! In a large bowl or mixer, mix ricotta and mascarpone together until completely combined, then add in honey, vanilla bean seeds and lemon zest. Beat until smooth. Cover mixture with plastic wrap and refrigerate 1-2 hours. Begin the glaze by whisking together sugar and cornstarch in a small saucepan. Stir in water, orange juice and lemon juice. Bring mixture to a boil and cook for 1 minute. Then remove from heat and let cool completely. Refrigerate until needed. For the dough: pulse flour, sugar and salt in a food processor until combined. Then add cold butter and pulse until butter is the size of peas and mixture is crumbly. Slowly drizzle in ice water with the food processor running until dough begins to come together. Then add eggs. Mix until fully incorporated. Set up 2, large pieces of plastic wrap and turn dough out. Divide in half, roll each half into a ball, then flatten each into a disc. Tightly wrap each in plastic wrap and refrigerate for at least 1 hour. Note: recipe calls for 1 dough disc, so you can freeze the second to use at a later date. Remove 1 dough disc from fridge and roll out on a lightly floured surface to 1/4-inch thickness. Carefully transfer to a lightly greased, 9-inch, tart tin/springform pan. Press the dough into the bottom and sides of the pan, then trim off excess overhang. Prick the bottom all over with a fork, cover with aluminum foil and place beans (or other form of weight) on top of the foil. Bake for 20 minutes, then remove foil and bake for another 15-20, or until golden. 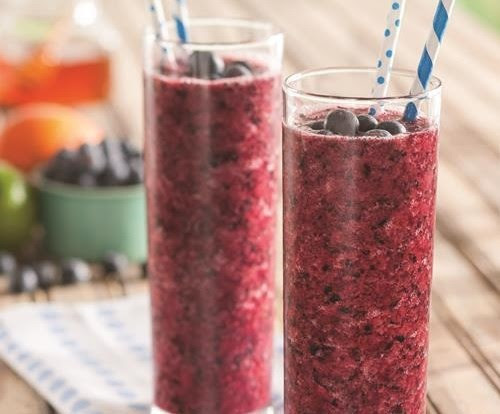 Combine berries in a large bowl and muddle slightly. Mix together so juices combine and set aside. Once crust is completely cool, spoon ricotta mixture evenly along the inside of pie shell and top with mixed berries. Spoon or brush chilled glaze over mixed berries and transfer tart to refrigerator. Chill for at least 2 hours before serving and enjoy! A Sweet St. Patrick’s Day! As the saying goes, everyone’s Irish on St. Patrick’s Day! Whether you’re looking to be a part of the parades and shenanigans, or plan on enjoying a quiet evening home, we hope you’re as excited as we are for this green-themed holiday. 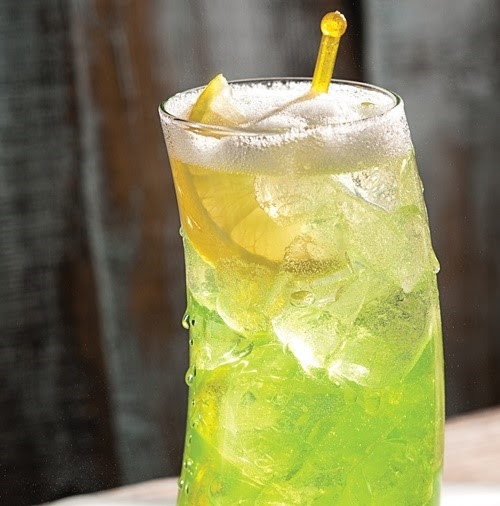 Celebrate St. Patrick’s Day with recipes like Honey Do Fizz, Irish Coffee Cheesecake and our sweet twist on the traditional Mojito, our Honey Bee-jito. 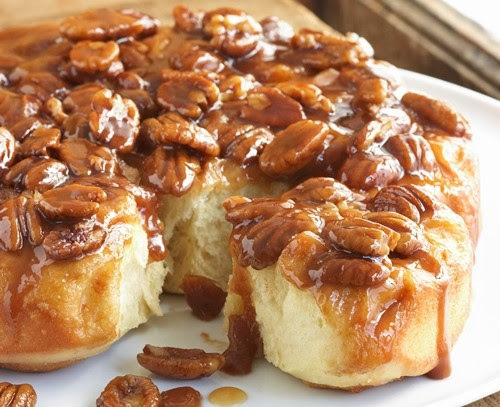 We hope that honey can make this St. Patrick’s Day a little sweeter! Fill a shaker with ice and add the rum, melon liqueur, honey and 2 lemon wedges, shake well. Strain into a tall glass filled with ice and fill with club soda. Preheat oven to 375°F. In a medium bowl, combine flour, salt and pepper. Dredge roast in flour mixture, coating all sides. Reserve remaining flour mixture. In a large Dutch oven, heat oil over medium-high heat. Add the roast and sear sides first until well browned. Next sear and brown the top and bottom of the roast, about 4 to 5 minutes each. Add broth, honey, ale, garlic and thyme. Cover and roast in oven for 1-1/2 hours. Add vegetables, cover and cook 1 hour more, or until meat is fork tender. Remove meat and vegetables to a platter and keep warm. To prepare gravy, add cold water to reserved flour mixture. Whisk water flour mixture into remaining juices in Dutch oven pan. Place Dutch oven over medium-high heat and bring mixture to a boil. Continue to stir and cook until thickened. Season to taste and serve with meat and vegetables. Note: If desired you may slow cook the roast in a crock-pot. Follow directions above through browning of pot roast. Place vegetables in bottom of crock-pot and place meat on top, cutting as necessary to fit. Add remaining ingredients, except water. Cover and cook on low setting for 8 to 10 hours. Prepare gravy as above. Wash and cut the avocado in half. Remove the seed and roughly chop the pulp. Set aside ½ the pulp. Wash the parsley and chop finely. Place 1 tablespoon of honey, lime juice, ½ the avocado pulp, parsley and water in a blender and blend on high for 20 seconds, or until thoroughly combined. Pour into a glass and enjoy. Preheat oven to 350° F. Combine crust ingredients (crushed cookies, oatmeal, honey, butter) in a large bowl, mix well and pat into bottom, and halfway up sides of a 9-inch springform pan. In a medium bowl, beat cream cheese with an electric mixer until light and fluffy. Add 1/2 cup honey, whiskey, 1/4 cup coffee powder, and flour; mix well. Add eggs, one at a time and beat just until blended. Pour mixture into crust. Place cheesecake on a cookie sheet, and bake 40 to 45 minutes until cheesecake is puffed and center is set. Turn oven off, and allow cheesecake to cool for 15 minutes with door ajar. Remove cheesecake to a cooling rack and cool 15 minutes. Run a thin knife around sides and remove the pan. Allow cheesecake to cool 30 minutes more; then place in refrigerator to chill. Meanwhile, make topping by whipping cream until thickened. Add 2 Tbsp. honey, 1 Tbsp. whiskey, and 1 Tbsp. powdered coffee, and whip until peaks form. Pipe or spread on chilled cheesecake and serve. 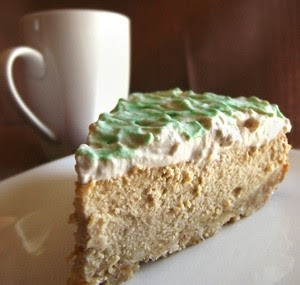 For a fun St. Patrick’s Day twist, drizzle green crème de menthe over whipped cream just before serving. 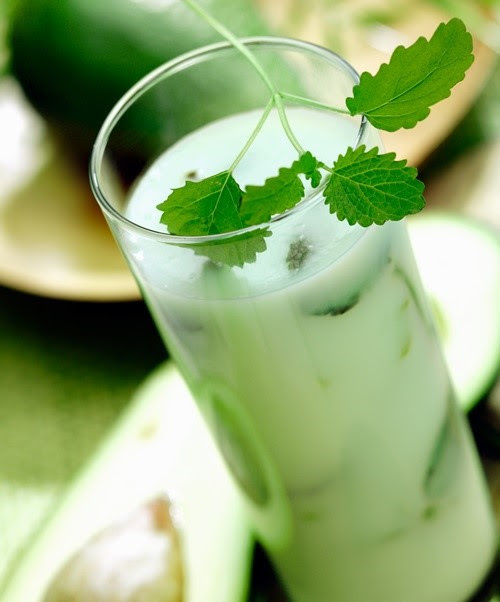 Place the mint leaves and honey in the bottom of a Collins glass and muddle to combine. 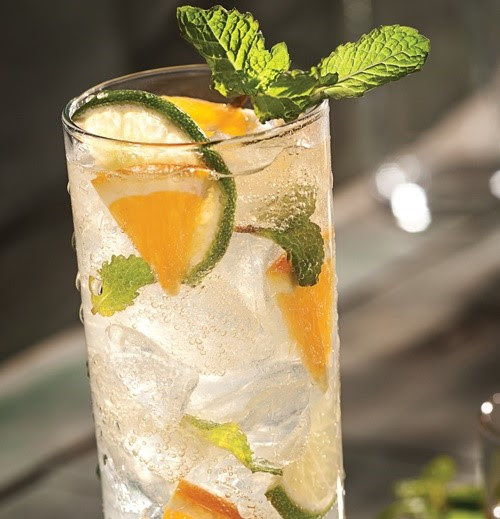 Squeeze and drop in the oranges and limes and fill the glass with crushed ice. Pour in the rum and fill the glass with club soda. Garnish with a mint sprig.